Sire: CH Janoby All About Aslann - "Aslann"
Dam: CH Watersedge Tru Destiny (IID) HT -"Jaana"
Raiven's movement is easy and natural so easy to watch and appreciate. She has beautiful eyes that are very expressive that add to her 'teddy bear like'. Raiven is a stunning and sweet girl that we are extremely pleased to own, she is very laid back and enjoys a simple life which demands very little. Say "work" and Raiven is locked on and focused, making her a little star in the show ring. This gorgeous girl has a willingness to work and loves being involved. She can be caught sneaking off with socks if they aren’t picked up quick enough. Raiven loves cuddles and belly rubs, which is typical of the breed and enjoys running around down at the beach and getting her paws wet. We are very proud of Raiven's sweet temperament and easy working ability and were happy to let her be used during Junior Handling - Doesn't Raiven and Jade look great out there together! This just shows that Finnish Lapphund's, especially Raiven, are fantastic with kids. Raiven completed 2011 with 35 show competitions in NSW, ACT and VIC - with amazing results!! 4th Nationally Best of Breed!! Out of more then 30 Finnish Lapphunds competing. Raiven was against more seasoned and awarded Lappies, but she was recognized as Best of Breed earning a lovely 20points. What a star! 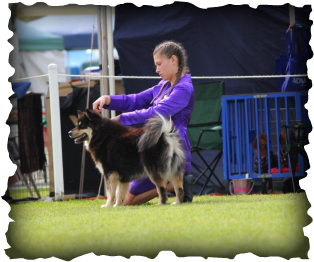 At the ACT Ladies Kennel Club, at 6mths and 5 days old Raiven took her first Best of Best against 3 other Finnish Lapphunds of more developed ages. Raiven didn't stop there, she continued and took out Minor Baby in Group! !